When central banks buy Treasury debt, central bank reserves grow and, when that happens, base money supply increases. Money supply is an important driver of economic growth; hence, it is fair to say that economic activity not only benefits from the fall in interest rates that typically comes with QE; it also benefits from the increase in money supply. Having said that, when money supply grows rapidly, inflation often follows. With the dramatic increase in QE since 2008, one could therefore fear the worst. Disinflationary factors such as demographics and globalisation have undoubtedly contributed to keeping inflation in check (see for example The Inflationary Impact of Ageing from April 2018), but it is still remarkable how little impact all the QE has had on inflation in recent years. There is a very good reason for that, which I will share with you below. 1. What will happen to all the UK Treasury debt currently held by the Bank of England when it matures? 2. If the Bank of England were allowed to monetise that debt, wouldn’t the debt problem go away? 3. What would the inflationary impact of such a process be? 4. Could debt monetization be used to solve the DB pension problem? 5. As lots of DB pension obligations are to low paid workers, a DB meltdown would probably raise inequality in society. Couldn’t monetization therefore reduce that inequality? Well, that was a bit of a handful! Consequently, I decided to turn my response into an Absolute Return Letter, so let’s get started. One thing to point out before I start, though. In the following I talk mostly about the Bank of England (BoE) and Bank of Japan (BoJ); however, pretty much every conclusion I come to over the next few pages can be applied to central banks all over the World. The term debt monetization will come up frequently throughout this letter, so let’s spend a minute on defining more precisely what it is. Think of a government’s nominal liabilities as either currency, central bank reserves or Treasury debt. Currency and central bank reserves are both considered money, whereas Treasury debt is not. To finance a deficit, governments need to issue Treasury debt. The burden of servicing that debt can be reduced dramatically if the central bank can transform interest-paying Treasury debt into zero-cost reserves - i.e. money. In practical terms, that is accomplished by allowing the central bank to buy large amounts of Treasury debt in the secondary market. If BoE owns about one-third of all UK government bonds (as it does), the UK government’s interest burden is approximately a third lower than it would otherwise be. The act of converting debt to money is what is often called debt monetization. As I started to dig deeper, I found that many commentators distinguish between debt monetization and full debt monetization. The difference between the former and the latter is quite simple. When debt is fully monetized, the central bank will hold it to maturity, and the debt will be cancelled (forgiven). National debt has risen dramatically in the UK in recent years – as it has in most other OECD countries. Not that many years ago (early 2000s), UK national debt amounted to about 30% of GDP. Today, it is almost 90%. It is a widespread fallacy, though, that the UK is more indebted than ever. 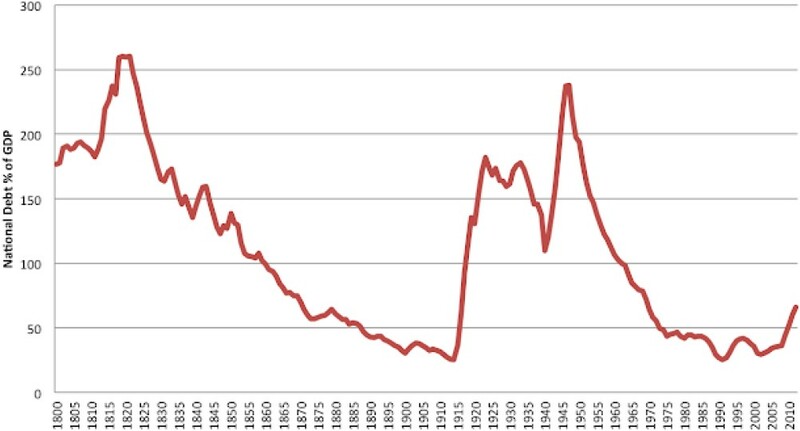 Between 1810 and 1825, and again in the years around World War II, UK national debt-to-GDP hovered around 200-250% of GDP (Exhibit 1). Source: NBER Working Paper 15795, Carmen Reinhart & Kenneth Rogoff. What is likely to happen eventually to all the debt held by BoE? As already stated, BoE holds about one-third of all outstanding UK national debt, most of which has been acquired under the ongoing QE programme. When all that debt eventually matures, BoE has (at least) two options. It can either (a) opt for a very conventional exit; i.e. the UK Treasury will have to repay BoE what is owed, or it can (b) cancel (forgive) the debt. In that case, the UK Treasury won’t have to cough up a single penny. 1. As the Japanese have learned in recent years, massive amounts of debt monetization, and a growing (but not yet significant) amount of full debt monetization, have had no impact whatsoever on Japanese inflation. 2. Research from the Federal Reserve Bank of St. Louis suggests that there is a significant difference between earlier episodes of debt monetization and the current one, and that central banks can to a large degree control the inflationary impact of debt monetization by managing interest rates correctly (much more on that below). Let’s look at Japan for a minute or two, as they are the furthest into the QE process. 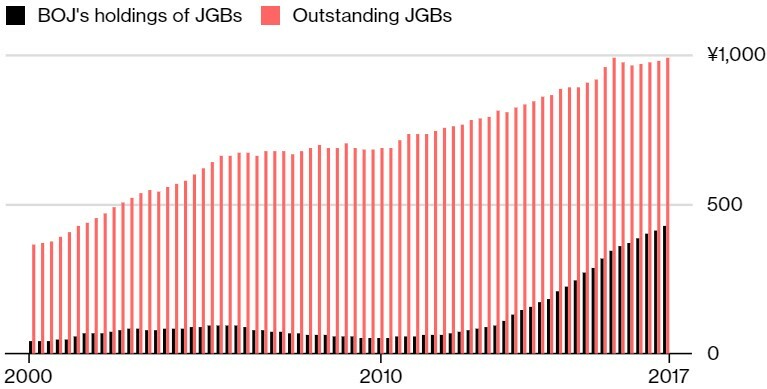 BoJ has become the Godzilla of the Japanese bond market and owns no less than 43% of all JGBs outstanding now (Exhibit 2). It never participates in new issues as it is not permitted to do so, but the ink is barely dry before it makes its first move. Apparently, it is not unusual these days for BoJ to own over 50% of a new issue within weeks of it going public. Source: Bloomberg, Bank of Japan. Now, more than five years after BoJ began to scale up its QE programme quite dramatically, there is still no indication as to what its exit plans are. That said, BoJ’s enormous size could pose a significant challenge, should it at some point decide to offload its portfolio again, as liquidity in the Japanese bond market has dried up. It is no longer unusual to have a day with no trading at all in some of the bigger issues. BoJ’s actions have simply destroyed liquidity in JGBs. Should BoJ therefore change tactics, who will buy what they would want to sell? This could drive interest rates up to levels a highly geared Japanese economy simply cannot afford. My bet is therefore for Japanese QE never to turn into QT – at least not in my lifetime. Debt monetization is nothing new. Other countries figured it out long before Zimbabwe did. As you can see in this research paper from the Federal Reserve Bank of St. Louis or in the chart below (Exhibit 3), the Fed has been engaged in debt monetization for decades. That said, you can also see that the correlation between the monetization rate - which is measured as the percentage of Treasury debt held by the central bank - and inflation has changed quite dramatically over the years. 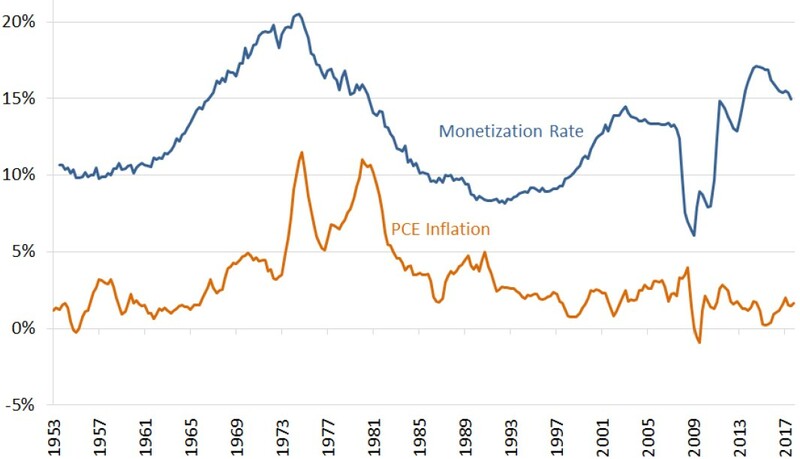 In the monetization upturn of the mid-1950s to the mid-1970s inflation correlated almost perfectly with the monetization rate. However, in the current monetization upturn, inflation hasn’t been affected at all. Why the difference? 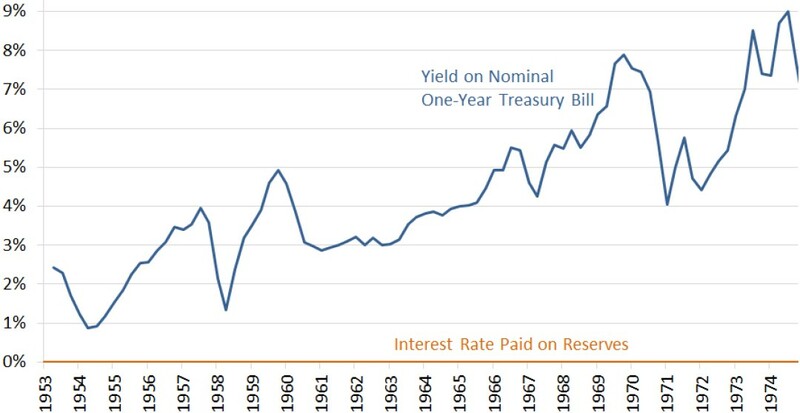 In the 20 years between the mid-1950s and the mid-1970s, not only was the spread between short-term interest rates and the rate of interest on reserves rising; it was also quite high in absolute terms, averaging about 5% (Exhibit 4). With such a high spread, commercial banks had a strong incentive to lend rather than just sit on their reserves. Making all those loans would boost the profitability of the banks, but broader money supplies would also increase, having the effect of driving inflation higher. Now, compare that to the same spread between 2009 and 2017 (Exhibit 5). As you can see, for much of the time, the spread was virtually non-existing, which made it preferable for banks not to lend. The spread even turned negative between 2011 and 2015, meaning that banks would make more money if they just sat on their reserves. No wonder there was, and still is, little inflationary impact from debt monetization in this cycle. 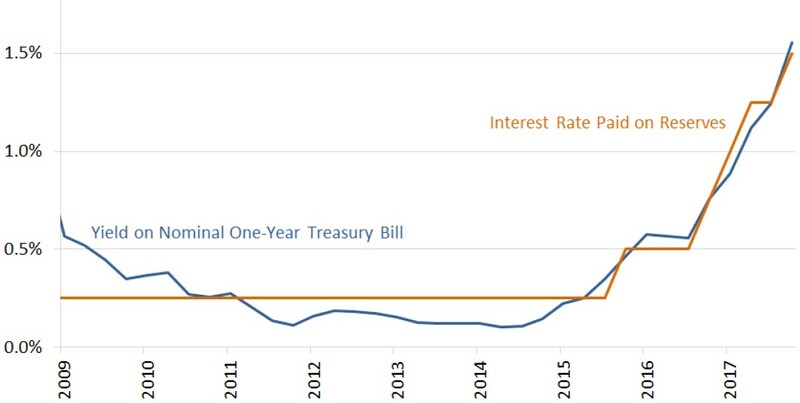 As you can also see, in 2015 when the yield on U.S. Treasury bills began to rise, the spread was still non-existing as US banks started to earn interest on their reserves; i.e. the Fed controlled inflation by making it relatively unattractive to lend, but that raises another question which I will address next. Is the current version of QE really debt monetization? Assume you own a government bond that pays an annual coupon of 1%, and that the bond is acquired by BoE. Assume also that you deposit the proceeds from the bond sale in your bank. In return, BoE pays your bank 1% in interest on any reserves held by it. From a debt monetization point-of-view, has anything been achieved? Not really. The cost of government debt has just been transferred from the Treasury department to BoE. For debt monetization to be ‘proper’, you need to replace interest-bearing debt with non-interest-bearing money or, at the very least, with lower interest-bearing money (reserves). Consequently, one could argue that QE in the US from 2015 onwards has been pretty toothless from a debt monetization point-of-view (which doesn’t imply that QE has achieved nothing whatsoever, but that is a different story). For debt monetization to work successfully - i.e. with little or no inflationary impact - you must make it unattractive for banks to lend. Therefore, the rate of interest offered to commercial banks on their reserves should always be as low as possible, and the closer to zero, the better, because only then is the cost of converting debt to money costless. Meanwhile, short-term interest rates must also be kept at a minimum; otherwise you incentivize banks to lends. This is all you need to know if you want to understand why interest rates continue to be so low everywhere – even in the most indebted OECD countries. This is the only way debt can be monetized successfully. That pretty much addresses questions 1-3 from previously. As far as Q1 is concerned, we don’t yet know if BoE is prepared to go as far as BoJ, but research from the US Fed as well as anecdotal evidence, mostly from Japan, suggests that such action won’t necessarily turn the UK into the next Zimbabwe. It is all about how interest rates are managed. As to the second question, if there is indeed a national debt problem (although Exhibit 1 suggests that the British have survived much higher levels of national debt-to-GDP before), then YES – it could potentially go away by further scaling up QE. I just don’t think BoE will convert to a major debt cancellation programme overnight. The Old Lady of Threadneedle Street will likely step very carefully. As far as the inflationary impact of such a programme is concerned, on one side of the equation you have Zimbabwe. On the other side, you have plenty of anecdotal evidence from other OECD countries, and you have quite convincing research from the Federal Reserve Bank of St. Louis. Who knows which way BoE is leaning with Mark Carney in charge? Could debt monetization solve the pending pension crisis? 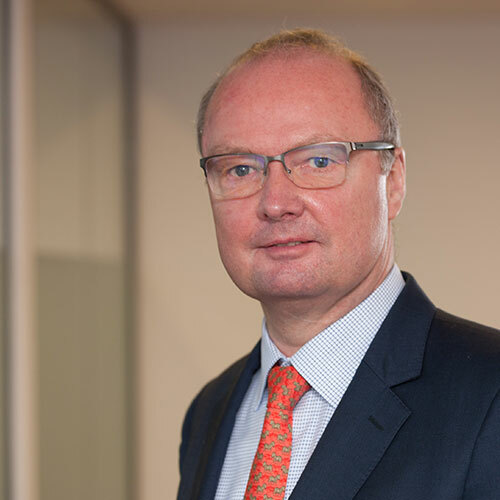 As to Q4 – could debt monetization solve the DB pension crisis? – let me offer a few thoughts. Going back to Sir Mervyn King’s statement from 2012, debt cancellation is akin to giving money to the Government. If you want the economy to prosper (which was, and still is, a key objective of QE), you can also choose to give money directly to households (so-called helicopter money) but, by doing so, you circumvent the credit system; i.e. you cannot control inflation by changing interest rates. I have in previous letters argued that one of the smartest ways to bring the helicopters in would be to introduce negative tax rates on the lowest incomes. The cost of doing so should be financed by tightening the prevailing subsidy programme, assuming you want to create a strong incentive for benefit seekers to (re)join the workforce. Giving money to the government is a different kettle of fish, though. With about £11 trillion of unfunded pension liabilities in the UK (about 5.5x UK GDP), and with a rapidly ageing populace, it is not exactly a small problem that we are confronted with. With state pensions and local authority pensions accounting for about 75% of the £11 trillion funding deficit, cancelling a significant part of government debt would go a long way to resolve the DB pension crisis, assuming inflation could be curtailed. Could debt monetization reduce inequality? As regular readers of the Absolute Return Letter will be aware, I continue to blame rising inequality - i.e. a growing gap between rich and poor – for lots of things around the world - President Trump, Brexit and the mess in Italy to name a few of our biggest headaches today. Is it feasible that debt monetization could effectively address this problem? My short answer is as follows: I am not convinced debt monetization can actually reduce inequality. I think a fairer way to describe it would be to say that debt monetization could possibly prevent the problem from getting any worse. Now to my slightly longer answer: It is absolutely correct that the DB pension system, which so many relatively lowly paid workers depend on for retirement, is on track to collapse unless something dramatic happens. It is therefore also correct that widespread cancellation of national debt - i.e. full debt monetization - would allow the government to improve the funding of underfunded, or entirely unfunded, pension schemes. I am not sure they want to get involved in the private sector (I wouldn’t) but, at least as far as state and local authority pensions are concerned, debt monetization could raise capital that wouldn’t otherwise be available. The biggest caveat is the potential inflationary impact, but the sense of responsibility amongst local authorities should also be closely monitored (but that can probably be dealt with through legislation). Not much has been achieved if local authorities go on a spending spree now that they have been bailed out on their pension obligations. Firstly, and probably most importantly, it is only fair to point out that not all commentators think what central banks are involved in at present has much to do with proper debt monetization - see for example this article. I don’t agree with every point Scott Sumner (the author of the article) makes, but he is absolutely correct when he states that, when interest-bearing bonds are replaced with reserves which pay an equivalent interest rate, nothing has been accomplished from a debt monetization point-of-view. If you want to monetize your debt, as I said earlier, you must replace interest-bearing debt with non-interest-bearing money. Having said that, if the primary objective of QE is not to monetize debt but to boost economic activity, does it matter whether it is proper debt monetization or not? Secondly, as far as the eventual exit route is concerned, let me re-introduce a chart I first used in the December 2018 Absolute Return Letter (Exhibit 6). Despite being the most indebted country in the OECD, as you can see below, the cost to Japan of servicing its vast amounts of national debt is actually quite modest when measured as a percentage of GDP, and the reason can only be the very low level of interest rates in Japan. This should serve as a reminder to other central banks - and to governments - that the debt path we are currently on will only work so long as interest rates are managed properly. As far as Japan is concerned, it is actually quite fascinating to watch how BoJ is perceived elsewhere nowadays. It is no longer the outcast in the world of central banks, as it was in the early days of QE (at least in the circles I move in). Now it is seen more as a pointer to the future, if I read various commentators correctly. Finally, you may recall that, in The Art of Defaulting, I discussed various ways to default more creatively. I should definitely have included debt monetization on my list of creative defaults, but I didn’t, and for that I can only apologise.